Our modules are made of premium 4135 alloy steel with strict forging and heat treatment for longer life. Every module is precisely made and has gone through rigid inspections with design pressure up to 7,500 psi. 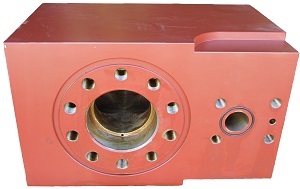 They are CNC machined and packaged for delivery with anticorrosion protection. We offer full lines of cylinder heads, valve lock covers, cylinder head threaded rings, cylinder head plugs, valve cover plugs, upper valve guides, lower valve guides, liner threaded rings, liner locks and wear plates, just to name a few.